Redwing 34 is the newest addition to the successful REDWING series. She is an ideal cruiser for the intracoastal waterways and coastal travel. She is designed for modest power including an outboard or inboard. Speed is a relaxing 8 to 10 knots depending on power selected. A sound isolated engine will provide hours of silent cruising. She will be economical to power and cruise long distances on very little fuel. She has accommodations for two or four with standing headroom throughout. Her generous size cockpit is ideal for lounging, fishing and having fun. It is not hard to imagine a quiet cruise as you enjoy the sights and sounds along the waterways. Construction is Stitch and Glue plywood and epoxy over straight frames and bulkheads. The hull will go together quickly, and finish and trim will take the most time depending on the level of finish desired by the owner. Plans include: materials, lines, set-up, construction, and arrangement. Purchase and Download Study Plans for the REDWING 34 for $5.00 in PDF format (zipped file). 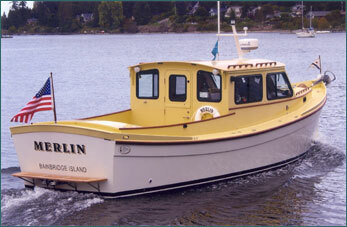 Purchase Construction Plans for the REDWING 34 for $820.00 for delivery by US Postal Service.